A timeless classic. 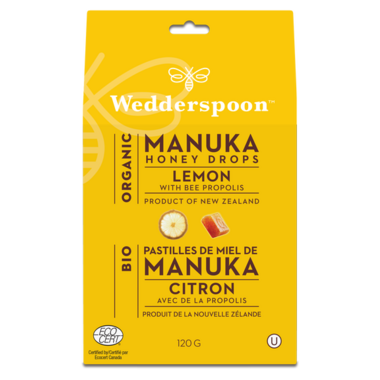 Wedderspoon's Manuka honey and lemon drops with Bee Propolis will surely become your new best friend. Zesty and soothing, these lozenges are both tasty and effective. Natural, Organic, Gluten Free, Dairy Free, Peanut Free Facility, Tree Nut Free facility, Peanut Free Product and Tree Nut Free Product. Wedderspoon Organic Manuka Honey DropsI -- Ikeep these on hand all year round, for sore, dry throat, whether from a cold, or during allergy season. I can't believe how soothing they are for a sore throat. Having recently had a very sore throat I ordered these because regular cough drops taste bad and don't do much good. These actually work well as well as tasting good. Read the ingredients and you will see why i recommend them.